According to the Park City Chamber Bureau, there are over 150 restaurants in Park City, Utah. Not too shabby for our small-but-growing town. There is a place for every mood, whim and craving. In fact, there are so many options that it can be difficult to decide where to go! This pleasant predicament gave me a fun idea: to poll my clients and see which restaurant is their favorite. The number one winner is Shabu! Since 2004, the Valaika brothers (Kevin and Bob) have been serving up freestyle Asian cuisine. This experienced duo is known for creating dishes that are both regional and global at the same time, similar to the Park City Lifestyle. We love the Caramelized Black Cod with a side of sweet and sour snap peas. Handle and Riverhorse tied for second. Handle has only been around a few years but it has quickly gained a large following. Handle specializes in American cuisine, mostly small plates. And they serve it up with fun cocktails, old and new. They use organic and local ingredients when possible. They’re always happy to accommodate the vegan, gluten-free and any other food sensitivity. Riverhorse on Main is one of Main Street’s oldest and most popular restaurants. A fun and little-known fact is that Riverhorse is actually housed in Park City’s renovated Masonic Hall. It can be described as having a trendy urban vibe, live music and a historical setting. The menu is constantly changing depending on the season and the creative cravings of the award-winning, executive chef, Seth Adams. If you want to dine at Riverhorse, plan ahead. Last summer we had trouble making reservations a week in advance. The Silver Star Café is uniquely located as a ski-in-ski-out location in the winter and a hike-in-hike-out (or bike) location in the summer. It is truly a gathering place where guests and locals are welcomed to their spacious patio (weather permitting) or their cozy indoor space. Their food is made from scratch and features regional foods of the American Melting Pot. Café guests are treated to live acoustic music every Thursday, Friday and Saturday. They were one of two Park City restaurants featured on the show “Diners, Drive Throughs and Dives.” Their outdoor patio boasts one of the prettiest views of Park City. And the prices are very reasonable. A family-run establishment, Blind Dog began in 1998. It was named after the family’s blind black lab, Rigger. 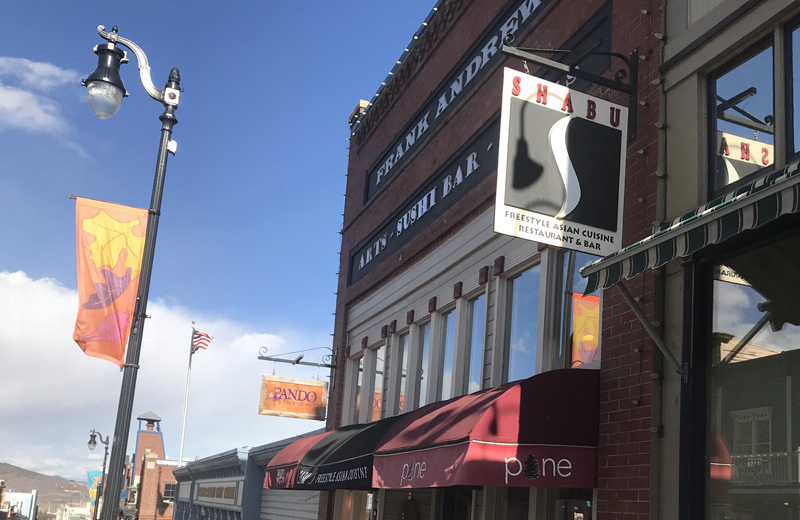 The Blind Dog features fresh, creative sushi and Japanese cuisine as well as traditional favorites like New York Strip Steak and Macaroni and Cheese. If you enjoy a fantastic wine pairing you are in luck. The Blind Dog has one of the most extensive wine and cocktail lists in the State of Utah. In the summer, the Blind Dog patio can’t be beat for live music and a laid back atmosphere. For over 3 decades, Baja Cantina has been feeding hungry Parkites original California-Mexican cuisine. Since they are located on a popular corner at Park City Mountain Resort, it is all too easy to pop in for a refreshing margarita, some spicy salsa and a piping hot plate of Cantina Taquitos. I have never eaten at Baja Cantina, but since it was a client favorite, I am committing to giving it a try this season. Walking into Chimayo is like walking into another town. In fact, this establishment shares the name Chimayo with a sacred location in in New Mexico. The Southwestern feel of the restaurant mimics the creative menu, a mash-up of southwestern cuisine cooked with a progressive French-American technique. The Coconut and Ancho Crusted Halibut is a favorite. I’ve also been known to partake in their Jalapeno Margarita, which is one of my favorite Park City cocktails. Donning lights and a charming storefront, Café Terigo shines like a jewel on Main Street. Terigo will warm your stomach and soul with fresh yet decadent Italian fare for lunch and dinner. After a long day of skiing, try the House-Made Herb and Cheese Ravioli paired with a glass of Chianti. The outdoor patio at Cafe Terigo is a summer favorite during lunchtime. Somehow I always order the Salmon salad because it is so good, I can not even think of trying anything else on the menu. High West does a wonderful job bringing together the old and the new. Beginning in 2007, the brand has grown to international fame with four unique locations. With its flagship location in the heart of Park City in an old livery stable and garage, you don’t have to love whisky to appreciate the Wild West atmosphere. Even the most reluctant whisky fan can appreciate the Dead Man’s Boots or the High West Lemonade. High West is a destination where I always bring out of town guests for a taste of “real” Park City. Their whiskey flight should not be missed, even if you are not a whiskey drinker. Although it’s located right on 224, Versante can be considered off the beaten path, and it will surprise you. Located in the Peaks hotel, this restaurant has recently been renovated in a Mountain-chic style. The menu features familiar favorites that will please everyone’s palate. There is a long list of salads and soups as well as pizzas, sandwiches and pastas. For the very hungry there are larger entrées and for the smaller patrons, a children’s menu. It’s a Park City family favorite restaurant. Apex is a Montage Deer Valley signature restaurant. It celebrates classic continental cuisine with 360-degree mountain views. The Apex offers guests a dining experience that is both relaxed and refined. The menu features iconic dishes that are prepared with fresh, local ingredients. 350 Main’s address is in the name. But don’t let that no-frills concept fool you. This local favorite features contemporary American cuisine in a stylish mountain dining atmosphere. They use local and sustainable ingredients that are sourced here in the Wasatch Mountains. Thankfully they brought back the Ahi Tower appetizer, which is a perennial local favorite. The “Steak Frites” is one of my husband’s favorite dishes in all of Park City. Prime Steakhouse is in the heart of Old Town. Located across the street from the Town Lift, this restaurant welcomes skiers after a long day on the hill equally as well as the elegant diner. The main room is also a piano bar and live music can be found most nights of the week. Their excellent steaks rival Ruth’s Chris and locals love the 2-for-1 entrees offered during the off season. Mustang is located at the bottom of Main Street and can be found by its signature outdoor fire-pit. It’s a wonderful spot to catch up with friends and enjoy a cocktail featuring Utah’s local spirits. Whether you are with a large group or on an intimate date night, you will enjoy the bold art and the bright flavors of Mustang. Another fun fact about Mustang is that you can park in the lot below the restaurant. Grappa is a study in transformation. Everything inside and outside would suggest a rustic country farmhouse. But what many don’t know is that this restaurant is housed in a former boarding house. The folks at Grappa serve up delectable Italian faire alongside from-the-top views of Main Street and the surrounding mountains. Grappa was Bill White’s first restaurant in Park City and is considered by many the most beautiful restaurant in town. Always popular, book early if you plan to dine there. Vessel Kitchen is everyone’s new favorite restaurant. It’s a casual, fast and delicious place to meet up with friends or grab a few dishes to take out. You can even order online. They are so committed to fresh and local ingredients that all of their partners are pictured on their website. The braised espresso beef made with local Pink Elephant coffee is a favorite. So there you have it, folks. The best restaurants in Park City, Utah, as voted by my readers. Did we miss one? Share in the comments below (be sure to let us know why! ).